Llanidloes is a perfect base for any cyclist as the town offers many cycle friendly routes which are still relatively traffic-free and offer great views of forests, mountains and lakes. We suggest several routes on this page from short excursions to day-long rides. We recommend you use our route descriptions in co-ordination with the Ordnance Survey maps for the area. Please remember that, particularly in winter, temperatures can be much lower in the hills and the changeable mid Wales weather means you should always ensure you carry wet weather gear. Llani Leisure sell clothing items suitable for cycling. 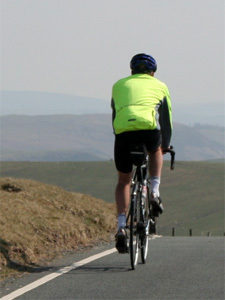 The nearest bike shops to Llanidloes are in Newtown and in Aberystwyth. To book journeys: includes all local trips, train station connections, airport connections and drop-offs for walking and cycling trips including luggage forwarding.